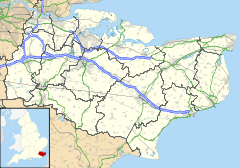 Greenhill is an outlying suburb of the coastal town of Herne Bay, in Kent in southeast England. The erstwhile Thanet Way, now renumbered as the A2990 road, separates Greenhill from Herne Bay. Greenhill is home to Briary Primary School for children aged from 4–11 years and Herne Bay High School for children aged from 11-18, a sports college which very recently gained its sports status. Greenhill has its own Gymnastics Club and a wide range of community groups and organisations. Residents also set up the first Partners and Communities Together panel, PACT, in Kent and were the first to launch a dedicated website. The panel is currently trying to gauge public opinion on the subject of having Greenhill officially reclassified as a village in its own right instead of part of Herne Bay. This page was last edited on 15 January 2019, at 08:59 (UTC).